I’m enshrouded in the fog of jet lag. I got back to Cairo a few days ago after spending a week in New York and Philadelphia for my 25th college reunion. It was fantastic fun and great to get a little break from Cairo. I had a hard start back in Cairo. We have all the usual end-of-school year stuff to contend with but, as we’re learning, June has an added punch when you have kids in international school: the big goodbye. Both boys have close friends whose families are leaving Egypt when school lets out, so there has been a mad crush of farewell parties on top of the normal schedule of year-end concerts and plays and conferences. A few days after I got back we threw a party at our house for one of X’s departing friends—this one returning home to China. Fortunately another mother helped and did the heavy lifting of cooking and baking. We’d recently bought a ping pong table from one of the many leaving families, which we had delivered the day before the party, so the kids were taken care of. We just pushed them outside and they played in the garden and had a ping pong tournament. I don’t know what I’m going to do when we’re back in an apartment without a yard. It makes entertaining the boys so much easier. The glut of families moving on has given us the opportunity to further furnish the apartment. Right before I left I made a mad dash to get it in better shape for O’s parents, who came to visit while I was away. I had a carpenter come put shelves up (they’re falling down now, probably a function of our uneven walls as much as anything), had him build an extra closet and bought a little commode so there would be a bit more storage in the guest room. Oh, and we bought a big sideboard for the living room and moved the one there to the dining room so we have room for glasses and platters and the like. But I still need more, so have been scouring the moving sales. It’s madness. There are two main Facebook pages where expats in my neighborhood post things for sale, one in English and the other in French. For a couple of days I would see something I liked, take a moment to consider it, and by the time I checked again it would be gone. When I looked more closely I saw that items go within minutes of being posted. Sherif, the carpenter, told me there are a couple of expats who buy everything and sell stuff on that they don’t want, and a few Egyptians who resell whatever they buy from the expats at a profit. So I’m getting aggressive. I did manage to score a lamp and a couple of rugs, which I have yet to pick up, but those were from a friend. By the time I get this place finished, we’ll be getting ready to move again and I’ll have to sell it all. This is a big week on the political front. As I write this, people are lining up all over Egypt to vote in the presidential elections for General Abdel Fattah el-Sisi. Notice I didn’t just say “vote in the presidential elections.” No, pretty much everyone out there is voting for Sisi. Journalists tweeting from polling stations around Egypt have been hard pressed to find anyone voting for his opponent, Hamdeen Sabahi. 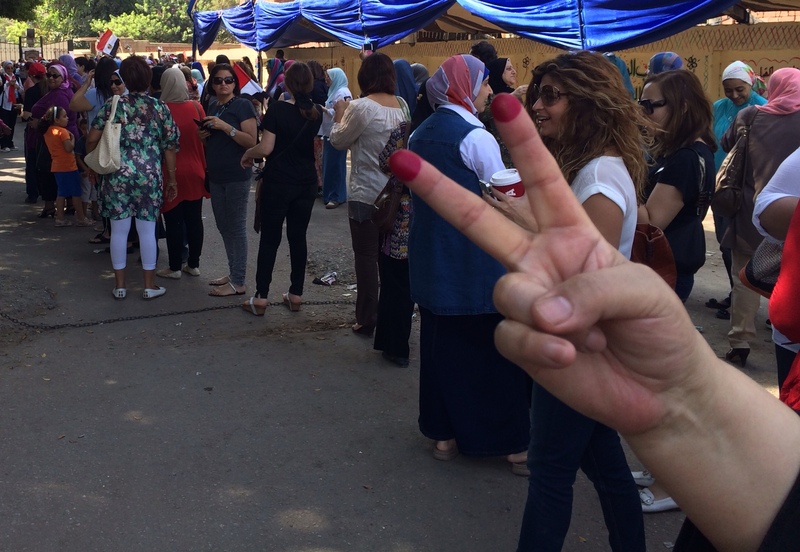 One journalist reported finding a Sabahi voter, who was promptly set upon by the crowd upon admitting that he’d done so. Sisi won Egyptian hearts and minds when he pushed the Muslim Brotherhood’s Mohammed Morsi out of the presidential chair, and he won 95 percent of the expat vote, which took place last week. Voting continues today, but the result is a foregone conclusion. The government is worried about the low turnout so declared today a holiday, but with temperatures hitting 108 the polling stations are largely empty. The news reports say that the election committee is going to fine anyone who didn’t go to vote. If you don’t hear from me for a while, assume I’ve gone underground to avoid prosecution. UPDATE: The election committee reportedly declared a third day of voting. They are determined to get that turnout number up! We have boxes. Ninety-one of them, to be exact. What we don’t have is furniture, i.e. anywhere to put all the stuff in said boxes. Which means we have piles of books on the floor and heaps of clothes on the bed in the spare room. All you friends I invited to come visit? Hold off for a couple of weeks or so, unless you want to sleep on mounds of ski jackets. Not that you’ve all been pounding my door down… But fear not. I am finally motivated to deal with our furniture shortage. Somehow it didn’t feel so dire when we didn’t need any more than we had. A couch, beds, a desk—that seemed like enough until now. Anyway…the boxes got here just in time. We had run out of cat food the day before. Yes, we have been shipping in cat food from New York all these months. (Just ask the few visitors we’ve had, or O’s work colleagues, who have all been kind enough to come bearing pouches of Weruva). Pathetic, I know, but we have the most finicky cats in the world (not that they particularly like the stuff we give them) and our vet in NY said that the grocery store brands that are available here are the nutritional equivalent of feeding our children Doritos all the time. A friend of mine said when I was done unpacking I’d wonder how l lived without all my stuff. I’m having the opposite reaction. I’m wondering why I have it. I didn’t miss it at all (except maybe the kitchen supplies and the bedding), and now that it’s here I feel weighed down by it. It’s been an interesting experience. I didn’t bring any personal mementos—no photos, no letters, nothing at all that had any nostalgic value. I wasn’t conscious of their absence until the shipment came, but there was a lightness that came from not being tethered to the past. Even the books I’m unpacking, with their memories of where I was when I read them and what was happening in my life at the time, bring with them a certain heaviness. The stuff arrived a couple of days after we got back from our spring break trip to a resort on the Red Sea called El Gouna. It’s a super-secure gated development about a 30-minute drive from Hurgada, and everything has been meticulously planned out. And I mean planned. There is little that is organic about it. Think Disney on the sea. O said it reminded him of Celebration, the Disney town in Florida. T also drew the Disney comparison. Having grown up on the beaches of Southern California, the uber-groomed vibe wasn’t my cup of tea (and the beaches aren’t particularly nice), but I can see why Egyptians love it. It is the absolute opposite of the rest of the country. Not a chaotic moment to be had. And it is lovely. There’s a beautiful marina surrounded by restaurants, and a little downtown area with eateries serving some of the best meals we’ve eaten in Egypt (if you go, you must try the superlative Zia Amelia, which is run by a couple of Italians). 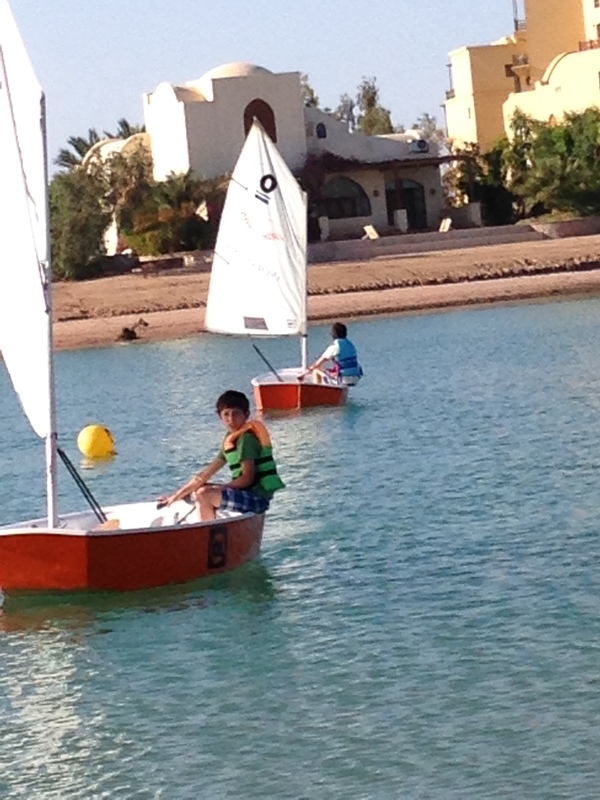 We chose to go to Gouna for the sailing school. I am now convinced that sailing is best learned in childhood. I loved being on the water but ducking under the boom as we endlessly practiced tacking and jibing was exhausting. O and I both wound up with scraped knees; the boys, on the other hand, had no idea what we were complaining about. They barely had to bend to let the thing pass over their heads. We’ve had more adventures with urban wildlife, this time in the form of a baby mongoose that seems to be living somewhere in our back yard. We’ve tried to take a picture of it several times but it’s a bit camera shy. Very cute ,though. We’ve been ever so slightly more mobile since O leased a car for work. During the week he has a driver who takes him to and from the office and I don’t have much access to it, but on the weekends we drive it around Maadi. Anyone who’s been to Cairo knows how utterly insane driving here is. There are essentially no rules, and those that do exist are unwritten and known only to the cognoscenti, which we most definitely are not. Driving here is so nuts that my father once got yelled at by a police officer for stopping at a red light. I keep wondering where that was. Where we live there are no traffic lights. We confine our driving to the Maadi bubble where it’s really not so difficult; still the car has made it easier for us to explore the outer reaches of our neighborhood. The blackouts continue, but more randomly now. Sometimes we’ll have two in a day, then we’ll go a few days without one. It makes life exciting, never knowing what activity you’ll be unable to finish. I’m learning to cook in the dark, as long as dinner is already on the stove. I get most nervous when blow drying my hair. I live in fear of being left with a head of hair that’s half straight, half curly. It’d be tough to pull that off. The government promises the outages will get worse during the summer months. I think I might have to break down and get some emergency lighting for the kitchen. Then again, our favorite restaurant just started delivering. Maybe I don’t need to be able to see that stove after all. Politically, it’s been more of the same. A few more university riots, a couple more bombs, a scattering of marches. Ongoing incidents of violence against Copts, and some tribal warfare in Aswan that left a couple of dozen people dead. It’s amazing what starts to feel normal. Then again, I guess that’s true everywhere. From here, it’s tough to understand how people in the U.S. go on as though nothing has happened after mass shooting after mass shooting. That’s it for now. Off to unpack some more boxes. Egypt continues to be in a holding pattern while it waits for General Sisi, the Minister of Defense who is widely viewed as the solution to all that ails Egypt, to announce that he will run for president. There are few who doubt that he will, and he has reportedly put a campaign team together behind the scenes, but for some unknown reason he has yet to formally throw his hat into the ring. Egyptians are getting antsy. In the meantime, the government is trying to create the appearance of activity by making various moves of its own. It reconstituted the Supreme Council of the Armed Forces to make the Minister of Defense—yes, said Sisi—its head, instead of the president. The government said the move was to bring the SCAF in line with the new constitution, but commentators in the media said that is not, in fact, the case. This isn’t the only instance of disconnect between the government’s interpretation of the constitution and the transitional roadmap and that of the media and punditry; the government also reads the timeline for elections in an entirely different manner than most of the rest of the country. Which leaves Egyptians knowing nothing, really. At the end of the day, the only analysis that matters is that of the Presidency, since the President is the one calling the shots on all of this. We’re all still waiting to hear exactly what he thinks. As if throwing innocent journalists in jail (#FreeAJStaff) doesn’t make Egypt look weak enough, things got downright silly last week with the AIDS Kofta scandal. For those of you who missed it, an army general claimed to have invented a wand that could detect AIDS and Hepatitis C from a significant distance, as well as inventing a 100 percent effective cure that involves drawing blood from the patient, breaking down the disease and returning it in a purified form. “I will take the AIDS from the patient and I will nourish the patient on the AIDS treatment,” the army general said. “I will give it to him like a skewer of kofta to nourish him.” Kofta is a kebab made of ground meat. What was most amazing was not that a senior official went on television and made such a ludicrous claim, but that a huge portion of the country believed him and attacked anyone who dared question the veracity of what he was saying. The President’s own scientific advisor was subject to a raft of insults when he suggested the general’s assertions were not true. We continue to furnish the house at a snail’s pace, but took what was for us a giant leap forward by acquiring a bed for the spare bedroom in preparation for our second houseguest, my friend @cacurtis. We spent a long and excruciating day at Egypt’s first Ikea and, in the end, had to leave before we’d bought half of what we needed so we’d be home before X was due to be dropped off from a playdate and our new mattress was to be delivered. Still, we managed to get a bed, some bedding, and a dish rack. Only took us about three hours. Eventually we’ll have to go back, but I’m dreading it. That place is like the Bermuda Triangle. Once you go in you never know if and when you’ll finally get out. We keep trying to join the gym, but it is as complicated as anything here. They don’t take credit cards or checks. We have to pay all in one installment. The ATMs never have enough cash for me to pull out the whole amount and I haven’t been able to remember to go to the cash machine two days running to get the money together. Actually, it’s even more complicated than that. Most of our money here is in a dollar account and I have to email or go to the bank in person to have it transferred into the Egyptian Pound account. You can’t say hello to a teller at the bank without waiting at least half an hour, so I try to make my trips over there few and far between. It always turns out, though, that when I want to pull money out of the bank, I haven’t transferred enough over to the Egyptian Pound account, and it won’t convert automatically, even if there’s enough money to cover the transaction in my USD account. And on the weekends, when I usually think of this stuff, there’s no one to email because round-the-clock banking has yet to arrive in Egypt. Finally this week I budgeted enough time to swing by the bank on my way to the gym—which is in the community center I’ve written about in the past—and, of course, their systems were down. I ended up paying the extortionate day fee just to run on the treadmill. And then we all got sick and the gym lost its appeal. I still can’t breathe through the congestion. And I’m still not a member of the gym. Tomorrow is @cacurtis’ last full day with us. We’re planning on renting a felucca in the morning and, in the evening watching the sunset over the Nile in a downtown bar and having dinner at Sequoia, an open-air, river-front restaurant in Zamalek. Maddening though it may be, Cairo is a stunning city. I was emailing with a good friend who recently moved to London, and we were remarking on how different our lives are at the moment. I was saying that while we love it here, when I was in Amsterdam a couple of months ago I realized that I was completely relaxed there in a way I never am here. I’d forgotten what it was like to be able to go anywhere, anytime and not have to worry about curfews (which we no longer have to do) or running into a Muslim Brotherhood demonstration, or just getting into trouble because of the language barrier. Just taking a taxi can be stressful because most of the drivers who hail from other parts of Cairo don’t know their way around our neighborhood, and with my pathetically limited Arabic I have a hard time directing them. I have to study more. As an aside, I also noticed when we were in Amsterdam that X had forgotten how to cross the street. There are no traffic lights in our neighborhood so crossing the street can be a challenge. If you can’t find a gap in traffic, you have to brazenly walk out into the street and hope someone will stop. We have found women rarely will—I guess they have enough BS to put up with in this male-dominated society that when they get behind the wheel of a car they don’t want to take any guff from anyone. X has developed the habit, as have I, of putting one hand up, policeman style, in the hopes that drivers will see that as a sign not to run us over. So far, it’s worked. But when we first got to Amsterdam, X would just step into traffic and hold his hand up. He’d forgotten there were such things as crosswalks. While we’re on the topic, I might as well mention that there are virtually no sidewalks here, either, so you wind up walking in the middle of the street. A friend of mine told me that someone she knows was back in the U.S. walking Cairo style. A police officer asked him why he was walking in the street. He said: “Where do you expect me to walk?” Apparently, he shared X’s organized traffic amnesia. Would love to know if you meet up with friends for coffee and while doing so, what you’re looking at or overhearing. I do meet up with friends for coffee. There’s only one place whose coffee I like, Café Greco. They have two outposts, one on Road 9, which is the main shopping street in my neighborhood, but it’s on the other end of it so I don’t get over there too often. The other one is in the Community Services Association, which is kind of a hub for expats. They run welcome programs and tours and have classes and a gym and a library and a little store and pretty much anything else a foreigner in Egypt would want. And a Café Greco, which is where I get my coffee when I’m not brewing the La Colombe that O ferries over from New York for me. The conversation is pretty much what you would find in a NY coffee shop. Post drop off, it’s mommy chat. Later on you’ll see business meetings. People meet for lunch. They talk politics. I’d estimate at least half the people I see there are Egyptian. I know some of the memberships—the video library, for instance—are limited to people with foreign passports, but I don’t know about general admission. It’s possible all the Egyptians I see there have second passports. Whoever they are, they’re a pretty cosmopolitan bunch. And everything there, from menus to posters to the monthly magazine, is in English. Okay, this is post getting to be long. I am going to save the rest of her questions for the next one so I can do them justice. On the home front, well, we had a lovely Thanksgiving at a friend’s house. It was perhaps the most American Thanksgiving I have ever had. The food all came from the club affiliated with the U.S. Embassy here, so the turkey was, I’m sure, Butterball and the fixings were as traditional as can be. The desserts were made by an Egyptian-British woman, but I must say they may well have been the best damn apple and pumpkin pies I have ever had. We are working on a Christmas tree. That’s trickier. We’re deciding between the fake tree and the little live tree that isn’t really a fir and the branches are too flimsy to hold ornaments. It’s a tossup. I’m hoping to get the boys to decide this weekend. If we manage to get out of the house. 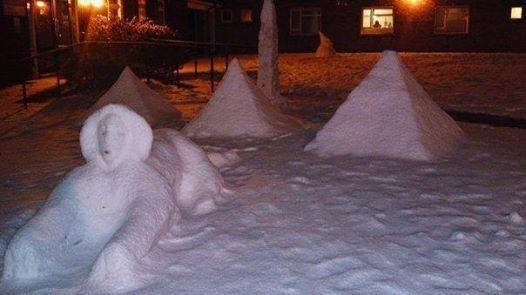 I canceled our planned trip to the pyramids today (yes, I was trying again) because it is so cold here that it was snowing in parts of Cairo. I figured it’s no fun riding camels in the freezing rain, and the monuments aren’t going anywhere. The weather is going bonkers here. 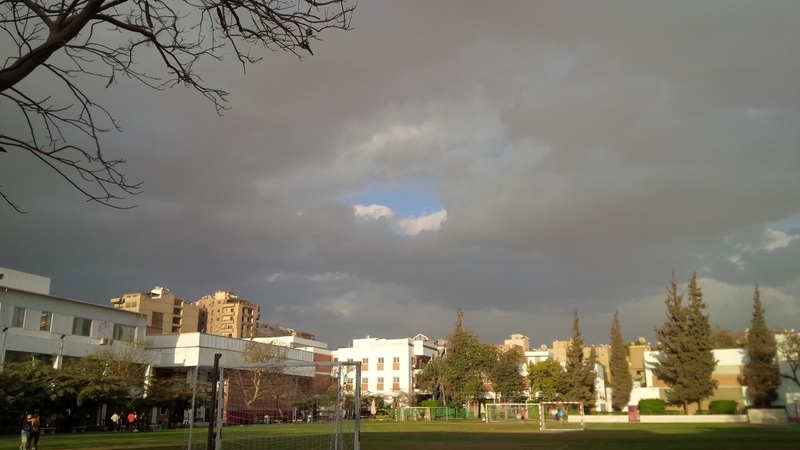 Yesterday we had a rainbow, which I was told was rare in Egypt. Today, snow, reportedly for the first time in more than 100 years. I wonder what tomorrow will bring. I didn’t take this but it is too good not to share. We had a little domestic drama this week. T was in his room when all of a sudden the light fixture came crashing down out of the ceiling. There was glass everywhere, and he kept yelling that it could have killed him. Maybe it could have. So I got a new electrician in—this one recommended by the lovely manager of the aforementioned American club—and he checked all the fixtures in the house. Apparently none of them is safe. But he didn’t have time to finish, so he’s coming back Saturday. I’m going to ask him to take a look at the still-electrocuting dishwasher, too. Maybe we can finally fix that thing. I had an interesting work week last week. I made it out of the Maadi bubble and up to Tahrir Square, where I interviewed one of the pastors at the Kasr El Doubara Evangelical Church, the largest evangelical church in the Middle East. They have some compelling programs, including several drug rehab facilities. Apparently they have a contract with the government and are the primary trainer of drug rehab personnel here in Egypt. The advantage of such slow movement is that every little step forward seems like a huge accomplishment. I learned, for example, that my ATM card works as a debit card at a few places. Doesn’t seem like such a big deal, I know, but one of the biggest annoyances here is that, with a mostly cash economy, I am continuously running to the ATM machine, which is a 10-minute walk away. Okay, it’s a minor annoyance, but a constant one. So finding that I could use my debit card at the local grocery store was transformational. In the absence of significant progress, one must celebrate the baby steps. The boys are still happy. X told me that he wants to stay here until he graduates from high school and T has discovered that he has a talent for the theater, so has been having great fun with that. He has potentially good news on that front, which I am not allowed to disclose until it is official, but if it comes off it would be very exciting for him. And he’s loving his Global Affairs class which, as far as I can tell from his description, will involve traveling around the country to do volunteer work. I’m sure there’s more to it, but that’s the part that has him excited. X’s birthday party is next weekend. I have managed to put together the kind of party that would leave me slightly nauseated in the U.S. –entirely over the top. Things are just so much more reasonable here. We’re having a giant bouncy slide, playground games and a popcorn machine, plus the requisite pizza, hot dogs, french fries and birthday cake. I drew the line at the cotton candy machine. I figured I didn’t need to throw unadulterated sugar into the mix. The kids in X’s class have been out of control as it is. They were all given school email accounts (what on earth were the tech people thinking?? ), and let me tell you, a bunch of 8 year olds can cause a fair amount of mayhem on Google Hangouts. Thankfully the school told the kids they weren’t allowed to chat anymore, but X with email is still a scary sight. I can see a serious BlackBerry obsession in his future. Thursday they had a pajama party/social. I dropped him off in the school gym, which was pitch black save for colored disco balls. The music was blaring. Some pretty good dance tunes—I was tempted to go in myself and take a spin, but he would have killed me. Parties certainly didn’t look like that when I was in 3rd grade—this was more along the lines of the Black Banana (a club in Philly, for the uninitiated). He was so excited. I had my first all-Arabic phone conversation when I called a carpet cleaner to try to get a rug cleaned. I wasn’t at all sure I had adequately relayed my request but, sure enough, the next day the cleaner in question showed up on my doorstep. I guess my Arabic is coming along—although it wasn’t exactly a complex conversation. We’ll see if I get the rug back. Curfew ended this week. It’s great news for Cairo and for all of Egypt, but I’m going to miss the quiet. The MB has marched by us a couple of times recently and they are LOUD. Apparently they have more planned in the coming days. I just got a disturbing phone call from someone asking for “T’s mom” and identifying herself as being from the trauma clinic. My heart froze, until she explained herself. I was out of town last week and T had a sore throat. The lab is far away, but they make house calls, so someone from the lab came here to take a throat culture while I was away. The results are ready now (never mind that it’s a week later and we have already figured out that it wasn’t strep), so they want me to trek out to their facility to pick up the results up and pay the bill. That part, the seemingly easy part, they can’t do on the phone. The more I start think I have this place figured out, the less it makes sense. And therein lies the fun. Well, I’d been concerned these blog postings had been getting a bit banal, but this week we have some real excitement in the form of ROCKET PROPELLED GRENADES. Ironically, although I spend an inordinate amount of time trying to distinguish between gunshots and fireworks (the popping sounds are usually fireworks), when I was awoken by two huge booms at 4:30 a.m., I told myself it was nothing and just rolled over and went back to sleep. Wrong again. Good thing I’m not a war reporter. Turns out a couple of over-armed black-masked men decided to try to take out a TV satellite dish; the main satellite field is located uncomfortably close to our house. A couple of days later, video of the attack surfaced on the Internet. The guys behind it were members of a Syrian group with ties to Al Qaeda. Fantastic. The assault on the satellite dish was the topper to the October 6 holiday, Armed Forces Day. There were festivities throughout the country. Needless to say, the MB thought the day presented a terrific opportunity to once again make their point that they are waiting for their democratically elected leader Mohammed Morsi to resume his rightful place at the helm of the Egyptian state. By the end of the day, more than 50 were dead and hundreds had been injured. Also on the urban warfare front: we have defeated the army of ants that had invaded our home. 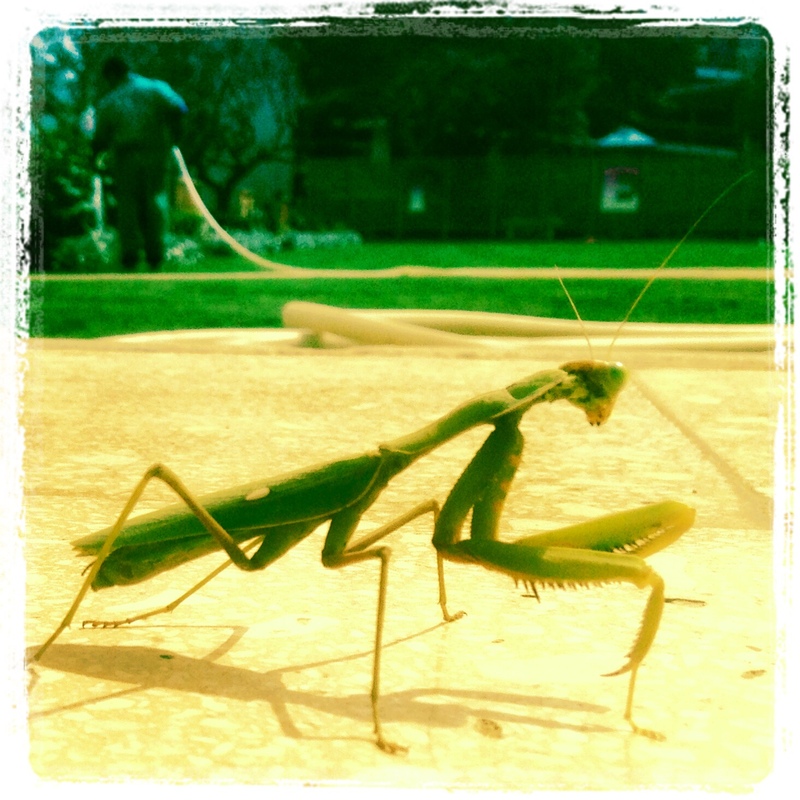 O came from New York armed with heavy artillery in the form of massive doses of ant poison. The traps proved fairly useless, but the poisoned gel that we piped into their lair did the trick. We can now leave food out in the open for more than 10 seconds without an ant assault. There are still a few stragglers, but we have at least temporarily defeated the occupying forces. O also brought with him a basketball hoop for T’s birthday. 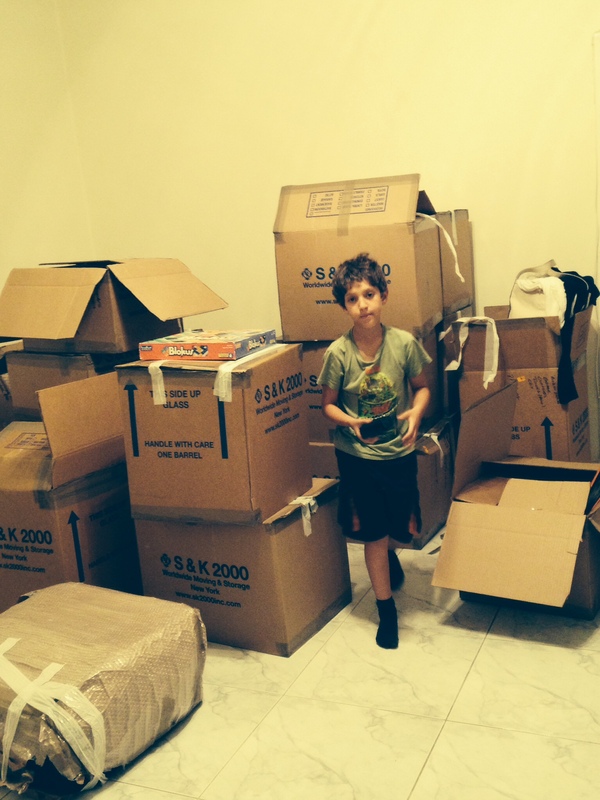 It was the one thing T told me he really wanted our house in Cairo to have, and he’s thrilled now that it’s here. He and X go out and shoot hoops nearly every day. And since there still isn’t a ton to do IN the house, it’s a relief that they have something to do outside. On the household front: The couch is due to be delivered any day now. I can’t wait. The carpenter stopped by yesterday and said he had finished building the loft beds and now they just needed to be stained. He had come to the house with swatches so the kids could choose fabric for their desk chairs. The choices were pretty limited but they both opted for a funky 60s-style graphic black-and-white print with bright orange and red accents. Quite cute. Finally, I realized I’d never closed the chapter on the shocking dishwasher. It’s still electrifying—apparently that’s just par for the course here, where nothing is grounded. But supposedly the previous tenants, who worked for a big oil company had an electrician who did ground the appliances, and there was some sort of extra wire that nasty Zanussi guy didn’t know how to deal with. So he attached it to the sink, and hence the jolting water. The electrician came and took care of that, but the dishwasher still zaps us. There’s a switch on the wall that cuts power to it, and he told me to just turn it off between cycles, which we now do. The one time I forgot, I got a little shock again. But now my laptop zings me as well, so I’ve decided to learn to live with it. Maybe all the extra electricity will be like getting hit by lightning and I’ll develop some sort of superpower.